Naughts & Cross stitches: Chickens are a pain ... they don't listen to reason! Chickens are a pain ... they don't listen to reason! Well my wonderful chickens that came with the house are slightly crazy. Chicken Little (the one in the above photo) was very eager to be fed when I appeared outside so she flew up to talk to me! Now 3 weeks ago they stopped laying or so we thought. They had been wonderful and laying all the time in the box we very nicely provided for them... then they suddenly stopped. Today we found out why! 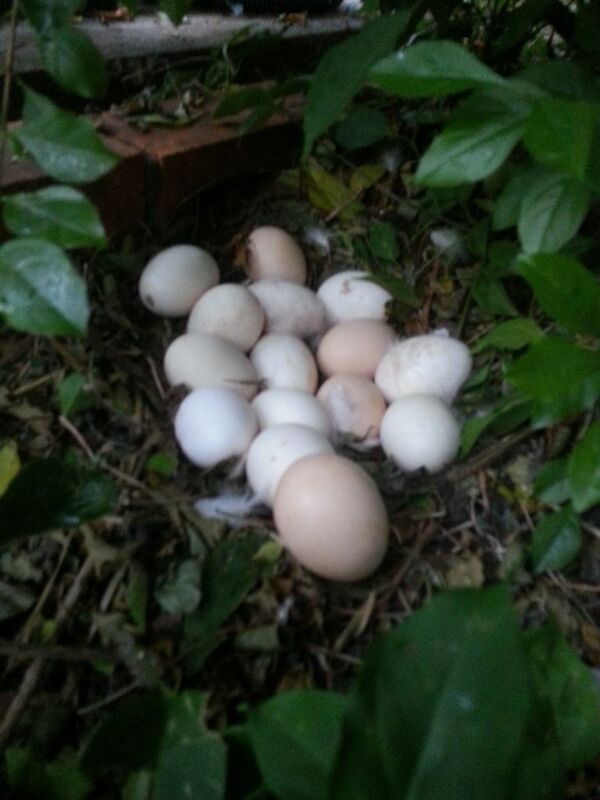 We lost Chicken Little, looked everywhere for her when my father noticed a bit of white under a bush! She was nesting! On a pile of eggs that would have to be at least a couple of weeks old! You can see the different coloured eggs... they have both been laying here! Annoying chickens! So now we know that they didn't go off the lay ... they have been laying under a bush. So now there is a brick under the bush and we need to go find a fake egg to put in the laying box. At least this explains our dilemma. 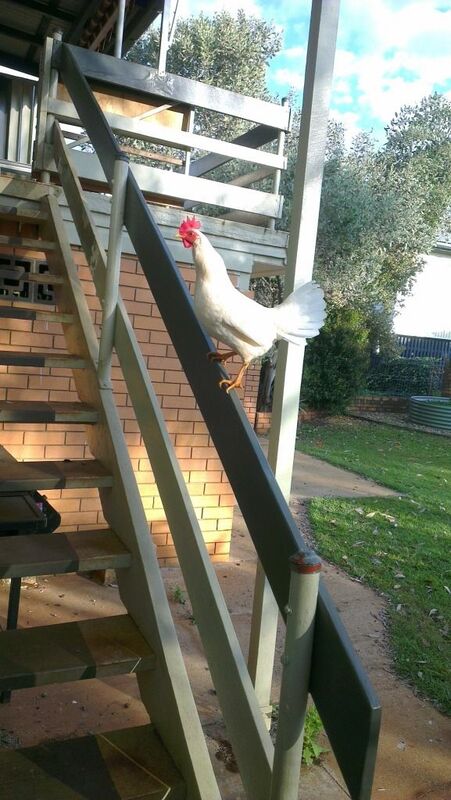 Just thought you might be interested in the fun of having chickens that wander the yard. Awww...poor chicken! Hope you get back to having fresh eggs again soon! Chickens must be interesting creatures! Sounds like you are having a fun time with the chickens. animals make us laugh sometimes ! That's interesting, I wonder what would make them start laying eggs in the bush instead of the laying box. Let us know if they go back to the box. LOL! That's funny... The things that animals do. So did they go back to laying in the box? Ha ha! I've always wanted a flock of chickens! I think I'll just live through you, though! At least you found the eggs before you has 25 little chicks running around!